The Edward Biberman mural and Venice Panorama have been reputed as renown symbols that renders Venice as a lengthy established and globally reputed pedestrian-amusement, located adjacent to the Pacific Ocean. 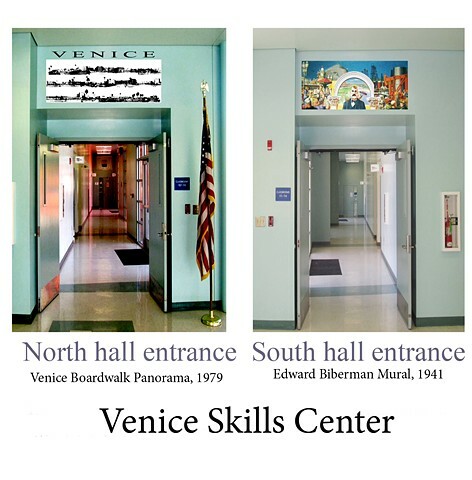 The Venice Skills Center was the inspiration and educational facility for my learning Photoshop, Graphic Design, Website Development and innovative progresses while attending there for over 15 years from 1999-2015. Now, as an alumnus, I work at home and anywhere wifi is available, I FINALY graduated. My thanks goes out to all the professors and staff at the VSC and I wish them all the best.